The Silver Arrow IB-E Extreme is Thermalright's flagship cooler that provides amazing performance due to its dual heatsink and fan design. The Silver Arrow IB-E Extreme edition uses two powerful 140mm fans which help maximum the best possible cooling capacity. Even popular compact water cooling systems are outperformed in terms of cooling performance by the Silver Arrow SB-E Extreme without any additional noise. The main novelty of the Silver Arrow IB-E Extreme is the revised design of the heatsink. 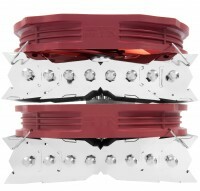 To ensure the best possible compatibility the aluminium fins are staggered. This allows this large CPU cooler to be installed onto virtually any motherboard without causing any interference with RAM or other surrounding components. The redesign also no longer blocks the top PCIe slot on ATX motherboards, which is a frequent criticism of users when using twin heatsink coolers. 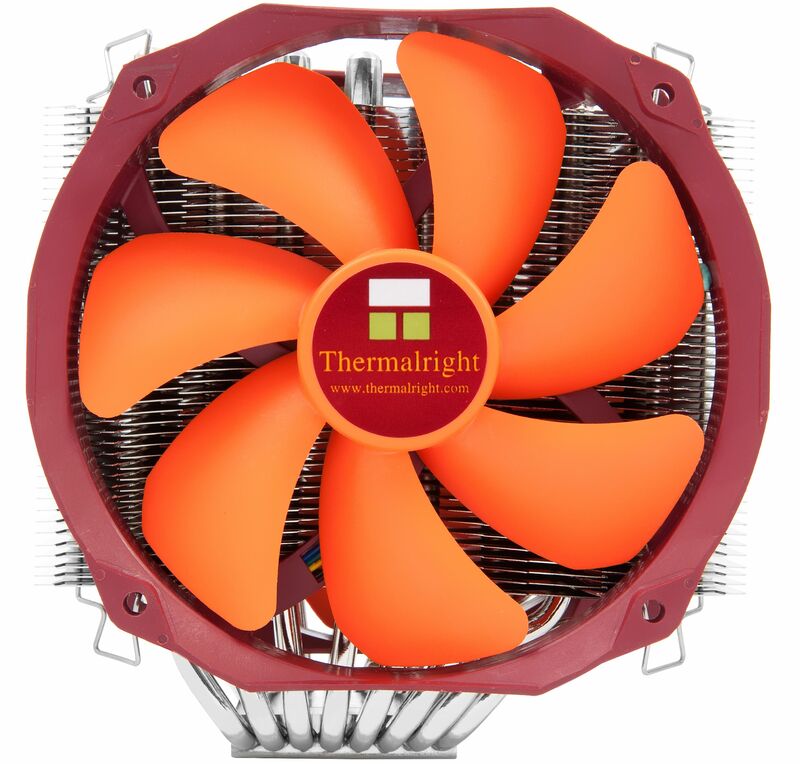 Thermalright were able to reduce the total height of the cooler by about 5mm, which means that the cooler can also be used in Midi-towers, but we still recommend that users double check the dimensions of the cooler to determine suitability. 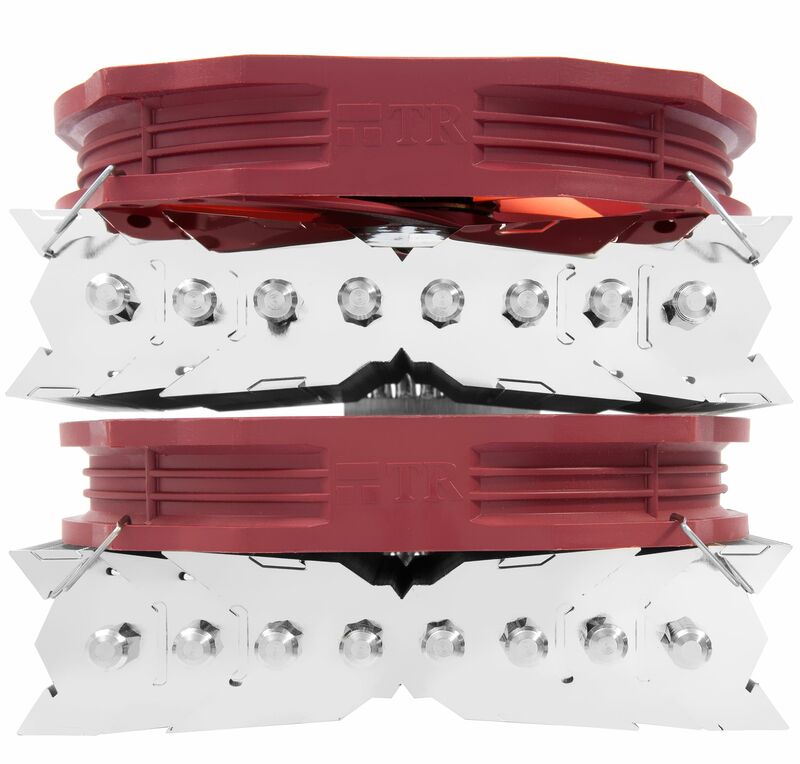 The twin tower design allows for a particularly large surface area and therefore forms the basis for outstanding cooling performance of the IB-E. Especially at low fan speeds and a low air flow rate the Silver Arrow offers an outstanding cooling performance. To increase the efficiency of the cooler, the heatpipes are soldered to the base plate which guarantee an optimal transfer of heat. To protect against corrosion the heatpipes and the base are nickel-plated. 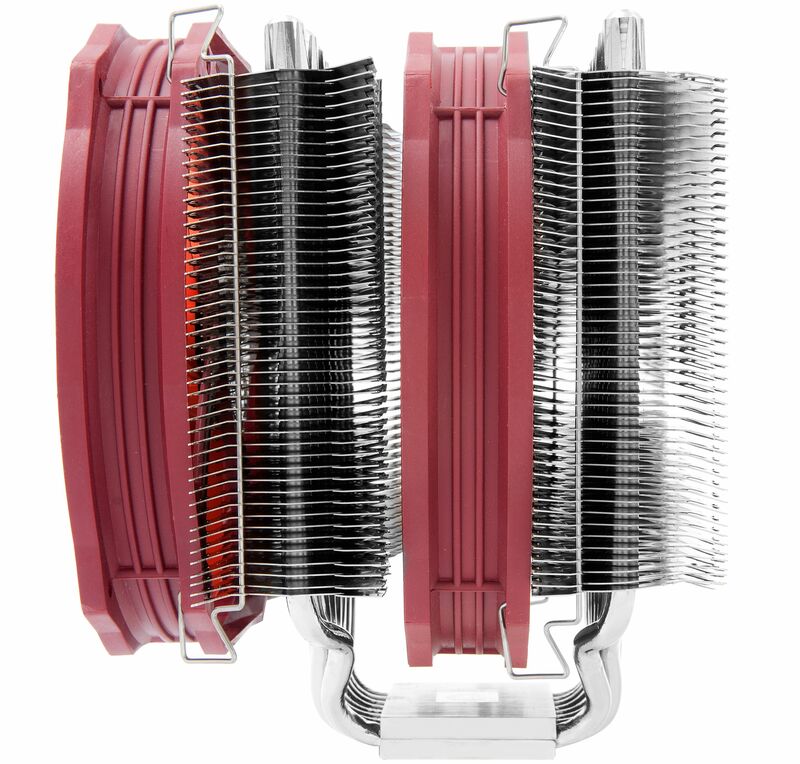 The heatsink sports eight 6mm sintered high-end heat pipes in order to dissipate the processor heat quickly and effectively. In conjunction with the two TY 143 fans all current processors can be effectively cooled. The powerful "Extreme" fans provide a maximum speed of 2500 RPM and provide air flow of up to 129.4 CFM per fan!. 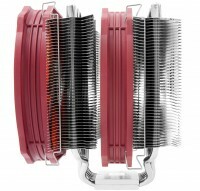 The Silver Arrow IB-E Extreme outperforms the vast majority of other CPU cooler currently available. 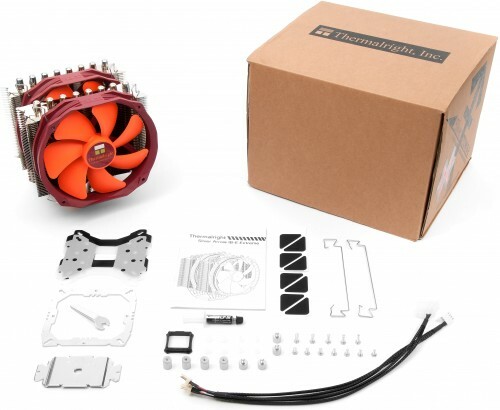 Compared to the non-extreme version, the total cooling capacity has been improved considerably; an advantage especially for overclocked PC systems. The downside to the "Extreme" fan capacity is the corresponding noise level. Although high, 45 dB(A) is not considerably louder than that produced by powerful a compact water cooling solution. The two double-ball bearing fans are PWM controlled and therefore can automatically adapt fluctuations in system temperatures. The extremely wide control range between 600 and 2500 RPM ensures the noise generated by the fans will be quite acceptable. Under low to medium use users can expect the noise levels to be around 21 dB(a), it is only when the PC is being used to it maximum will the fan speeds increase. The base of the cooler features a slightly convex shaped support surface. 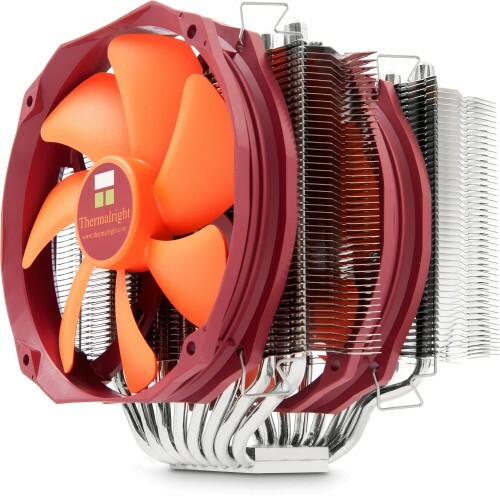 This design was first developed by Thermalright several years ago and has been "borrowed" from other cooler manufacturers since. In comparison to a flat surface the convex shape further optimises the cooling performance, especially on Intel systems. The Silver Arrow SB-E Extreme is a multi platform compatible cooler and comes with mounting material for all common socket types. Owners of Intel LGA775/1366/1155/1156/2011/1150/2011-3/1151 sockets and AMD AM2/AM2+/AM3/AM3+/FM1/FM2+ can all use the cooler.